Space technologies are used to track marine animals, many of which have been fitted with Argos transmitters to follow their movements, while satellite altimetry data are giving us new insights into their behaviour and migration patterns. For example, humpback whales in the southern hemisphere follow a specific migration path, spending summer in the milder waters of the Southern Ocean in search of food, and winter in tropical waters where they mate and give birth. 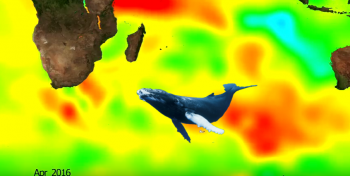 Humpback whales reappeared around Reunion Island in 2008 and were seen there up to 2014. But in 2015 and 2016, they were seen only rarely and left much earlier than usual. What happened? Several explanations have been suggested. Did El Niño alter the ocean currents? If so, the impact would have been minimal, as humpback whales are thought not to be affected by currents and storms. What’s more, analysis of maps from altimetry satellites shows no significant change in currents. - and sea ice extent is decreasing; as phytoplankton need sea ice in spring to develop, less of it means fewer phytoplankton and therefore fewer krill. However, data from the SARAL satellite show that, unlike in the Arctic, sea ice extent in the Antarctic has increased in the last three years as warmer waters drive glacier melting that is releasing large volumes of freshwater. As the water is less saline and its freezing point rises, this likely explains why there is more sea ice. Scarcity of food nevertheless remains a possible explanation for the humpback whales deserting the region. With fewer krill around, the whales may have found more favourable feeding grounds or simply stopped making the long trip to Reunion and Madagascar to conserve energy.